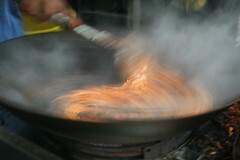 I got your noodles right here, buddy. 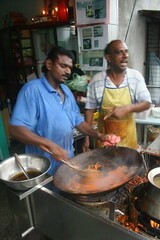 This mamak (Indian Muslim) stall prepares a half-dozen varieties of the fried noodles called mee goreng, rapidly whirled in a chili-tomato sauce, and a like assortment of mee rebus. 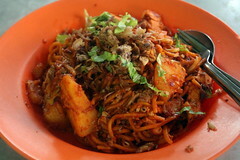 Though notes are sketchy from the dying days of my laptop's operating system, this mee goreng, besar (in effect, "with everything"; rm 5, or about $1.40 at the time) would likely have included bean sprouts, onion, fried tofu, potatoes, egg, prawn fritters, and, though not visible here, curried squid. 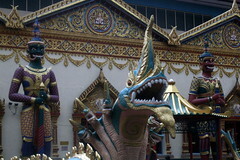 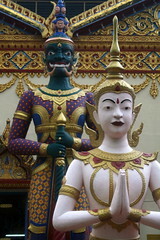 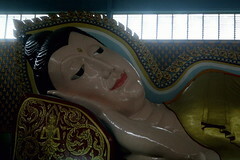 Also shown below: Several photos from the nearby Wat Chaya Mangkalaram, the Temple of the Reclining Buddha.